Its an awesome post like he post every time, then I tried that thing in my personal salesforce org, and within few minutes I can see that tree in my org. He's is using Jstree, its a jquery plugin, that provides interactive trees. So that was so simple, and too much awesome, I would love to thank Jeff for doing such great things. There is a component that he created and called that component on the page. 1. 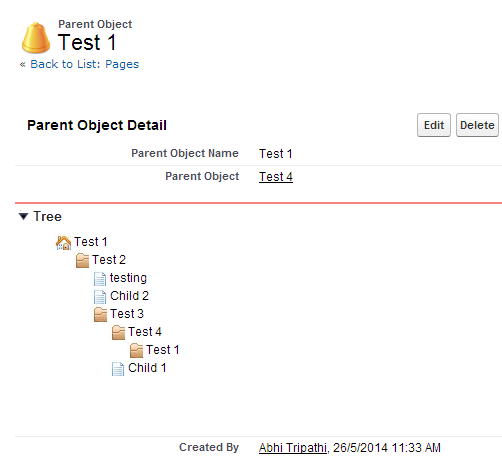 Create an Object named Parent Object. 2. Add a parallel look-up to the Parent Object of its own. Name the field "Parent Object". Did you ever run into the tree not loading childs? It's blank for me. The child records do exist and the lookup field points to itself.